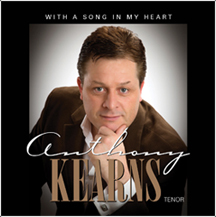 With A Song In My Heart is a compilation of songs that have been my companions on countless tours and concerts in Ireland, North America and beyond. For the many friends I have met at various concerts and events, I thank you and am grateful for your continued support over the years. I hope you enjoy what you hear, and that you, in turn, are inspired and find a song that touches your heart. May God bless you and keep you safe until we meet again. Album to be released on OCT 12th . All pre purchases online to be shipped out on Oct 13th.